With the 2016 Olympics on the horizon, 27-year-old Alia Akinson is preparing for her fourth Games. 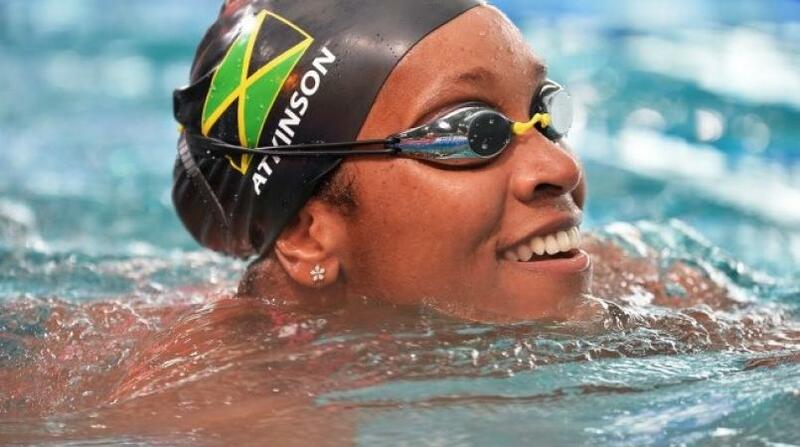 Not only is the Jamaican swimmer a veteran of the sport, she’s also a pioneer. As the first black woman to win a world title, Alia gives Women Who Like Sport a fascinating insight into why she still struggles for sponsors and funding despite her achievements; racism and stereotypes; and challenging the likes of Usain Bolt to win over Jamaica’s youth and grow her sport. What is it about swimming that keeps you in the sport? My parents started my brother and I at a swim club when we were very young. I was around four years old and he was three years older. I used to just splash around in the shallow end of the pool but I longed to go to the deep end where all the kids who could swim seemed to have all the fun. My brother, Adi, had learned the breaststroke so I asked him to teach me. He would repeatedly tell me to “practice, practice, practice!” Every evening we would do it together and one day I made it to the deep end all by myself. It was such a great feeling. I think it was then that I started to love the sport. It made me see the immediate benefits of setting a goal and remaining focused until it’s achieved. How brutal are your training sessions? They can be very harsh. You have to find that threshold to determine just how much your body can take. I currently swim 55km (34miles) per week in two-hour pool sessions – morning and evening. There are also gym workouts and track training, so you can imagine the effect on the muscles at the end of the day. The way I recover is to ensure I get enough sleep. Most people should get about 8 hours each night, but I need between 9-10. It’s important – it’s your body that works hard during the day, and at night during sleep it’s your mind at work. It goes over all the specific techniques that were practiced during the day so that when you restart training it remembers them. With insufficient sleep you simply have to do them all over again. Who are your inspirations in swimming and in life? What memories did you take away from your first Olympics (Athens 2004) as a 15 year old? To be perfectly honest I didn’t feel any pressure to perform at those Games. Everybody felt that it was sort of an initiation into the big league. I was mostly overwhelmed by the whole idea of travelling to what everyone said was ‘the centre of civilisation.’ It was awesome. I even had a chance to visit the Acropolis and the Parthenon [Ancient Greek historical sites]. These places are old. I mean really old! Some people told me that they were over 4,000 years old. It’s one thing to read about these places in history books, but it’s quite another to visit them in person. In terms of competing, I looked at it as a learning experience. In the heats of the 100m breaststroke I swam a lifetime best time and finished third. It was a good experience! You finished fourth in the 2012 Olympic final without any financial support. How difficult was it to fund yourself? Well, I did get a little bit of help from the Olympic Solidarity Movement. But I must say that I am very fortunate to have a solid family structure and they all, without exception, rallied around me and provided the funding that was needed. One of my main difficulties was finding a constant supply of swim suits. They are so expensive and have a limited life. Why do you think you struggled to attract sponsors? It’s not so much ‘my struggle’ as it is the struggle of the sport itself. Firstly, swimming is largely regarded as a minority sport in terms of participation, viewership and indeed spectator support at meets [competitions]. Sponsors normally look out for those avenues whereby they can get the most exposure for their product. They see that they can get this from famous athletes with whom the public immediately makes a positive connection, but swimmers aren’t that popular. Secondly, I have found that swimming, because it’s a white dominated sport, sponsors are not inclined to endorse non-white swimmers to sell their goods and services. There is the mistaken view that consumers will only buy if the products are endorsed by people like themselves. Which, as you can tell, is one of the reasons why we have such a low percentage of minorities swimming. Thirdly, some potential sponsors in Jamaica have told me that because I live overseas it is difficult for them logistically to do any endorsements. They cite reasons such as my unavailability for live interviews and personal appearances etc. I can see their point, but if the sport was more popular they would have found a way. There is a much publicised stereotype out there that black people cannot swim. Has this ever hindered your career? Are you kidding me? This is of course a myth perpetuated by the uninformed. Black people have been swimming since the 1400s – just check our swimming history at the International Swimming Museum in Florida! Back then when the Europeans encountered Sub-Saharan Africans, they found culturally aquatic people who taught themselves to negotiate the coastal waterways and the rivers that ran by their villages. Then came that horrible thing called slavery, then segregated pools etc. You know the drill. But right now, it is a matter of economics. First of all you need pool membership, then you have to pay a coach, then you have to buy expensive swim wear, then you have to fork out funds to travel to meets after paying entry fees and so on. It is much easier for a youngster to get a football and play with their friends in the park. As a black woman in a predominantly white sport how has racism affected you? Racism has not affected me directly in the sport, although there are one or two instances of indirect racism that I have been aware of. It is hard to ignore the stares on an all white pool deck – from not only the white swimmers, but the coaches as well. It’s a way of communicating the notion of: ‘What are you doing here?’ They won’t ask you directly but you feel unwelcome. I remember on one occasion when FINA, the world governing body for swimming, had this program of diversity whereby they would encourage swimmers from non-white countries to participate in their meets. 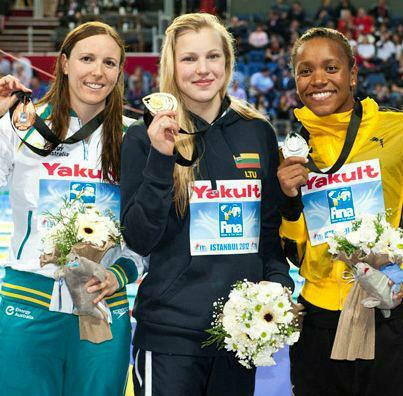 On one occasion there was this female black swimmer from a non white country, I’m not sure which. She went on the blocks for the 50m freestyle preliminaries, but her starting position was all wrong. I mean, it was way off. She could swim but obviously had no training whatsoever on the blocks. No one, I mean no one, would offer any assistance. I went over to her and showed her the correct way to start. She didn’t win the race, but she didn’t place last either. She came over to me afterwards and said thanks. Do you feel that black swimmers and swimmers of colour are welcome in the sport? We are being accepted. More so now than in the past. FINA is doing a great job in trying to open up competitions to all nations to gain an equal playing field for all countries. But we still have a long journey ahead to make it equal. With more swim clinics, water awareness and promoting swimming as a life necessity, we can one day all be equal. Many female athletes have to deal with negativity surrounding their muscular bodies. Have you ever struggled with disparaging comments? For the most part, I get asked about my body as a black person, not just as a female. The majority of athletes of colour usually have a bigger build. I have been asked if that slows me down in the pool, but the majority of questions are merely out of curiosity. Pure unadulterated joy. Some people have called my reaction ‘priceless.’ But here’s the thing: I had no idea. I mean, absolutely no idea after finishing the race that I had won. I mean, it was close – finger nail close. It was the final of the 100m breaststroke and she [Ruta Meilutyte] was ahead of me after the turn. But then I began to close – fast. I caught up with her and we were going into the wall [the end of the race] stroke for stroke. And I either did another half stroke or a more powerful kick for extra thrust and we touched the wall together. Or so it seemed. I looked up at the results board for the second spot to see my time but didn’t see my name. I looked at her and she wasn’t celebrating as she normally does. All this is taking place within seconds following the finish. Odd, I thought. So I looked back at the board up to the first spot and… whoola!! Not only had I won but I had equalled the world record. My reaction was indeed priceless. It is indeed one for the history books! Since your world record and world title, how have you dealt with the increased media attention? Not only was the achievement reported in the Jamaican national news it was all over the world. What I hadn’t realised at first was that they didn’t headline the race per se but rather the fact that someone of my skin colour had done this as a first. It snowballed: black swimmer did this, black swimmer did that. But it was an exhilarating feeling and still is. I give as many radio and television interviews as possible as I realise that it’s an opportunity for me to talk about the sport, how to improve it, try to get more kids interested and promote water safety. We try and fit the media attention around my swimming responsibilities. Coming from a country that is track & field crazy and has a global superstar in Usain Bolt, how big of a challenge will it be to convince young people in Jamaica to compete in swimming? Well first of all, we don’t have just one global superstar, we have many of them. We have the Olympic and world champion Shelly-Ann Fraser-Pryce. We have Asafa Powell – the man who has run the most 100m races under 10 seconds. We have Yohan Blake, who has run the second fastest times ever in the 100m and 200m. And many more. Bolt is now earning over US$20m (£15.25m) per year from prize money, appearance fees, product endorsements, sponsorships etc. And the others as well. I realised early on that my challenge is to find ways and means of teaching the population the importance of learning to swim. If we can decrease the percentage of people that don’t know how to swim, and decrease the number of deaths by drowning, then that’s a win for me. You say you want to improve the infrastructural support for swimming in Jamaica, what do you want to see done? I said earlier that swimming is a minority sport in Jamaica – that’s because the financial support for its development puts it way down on the totem pole. But there are still things that can be done. There’s huge demand for a pool in Montego Bay, which might serve as an international swimming hub. Who wouldn’t want to come and train in Jamaica? We need to start advertising and promoting our national resources, finding sponsors to fund such a development, and in due time, the place will be supporting itself. So Rio 2016, your fourth Olympics, is on the horizon, what is the one thing you are hoping to take away from the experience? This is probably the most important one because I have the opportunity to do something special. The one thing I want to do is to know that I swam my perfect race. If I come out of the pool knowing that there is nothing that I could have done better, then I would have done what I set out to do. If that gives me a podium finish then we will all be happy. You can follow Alia on Twitter and Instagram.